The KVM-TEC UVX1 Ultraline 4K IP Receiver pairs with an optional transmitter and extends DisplayPort and USB signals up to 328' over a single CAT6a/7 cable, sold separately. It accepts up to DCI 4K resolution at 60 Hz with 4:4:4 sampling at 8-bit in real time. Four USB ports allow you to output keyboard and mouse signals as well as USB hard drives and memory sticks thanks to a built-in USB upgrade feature. 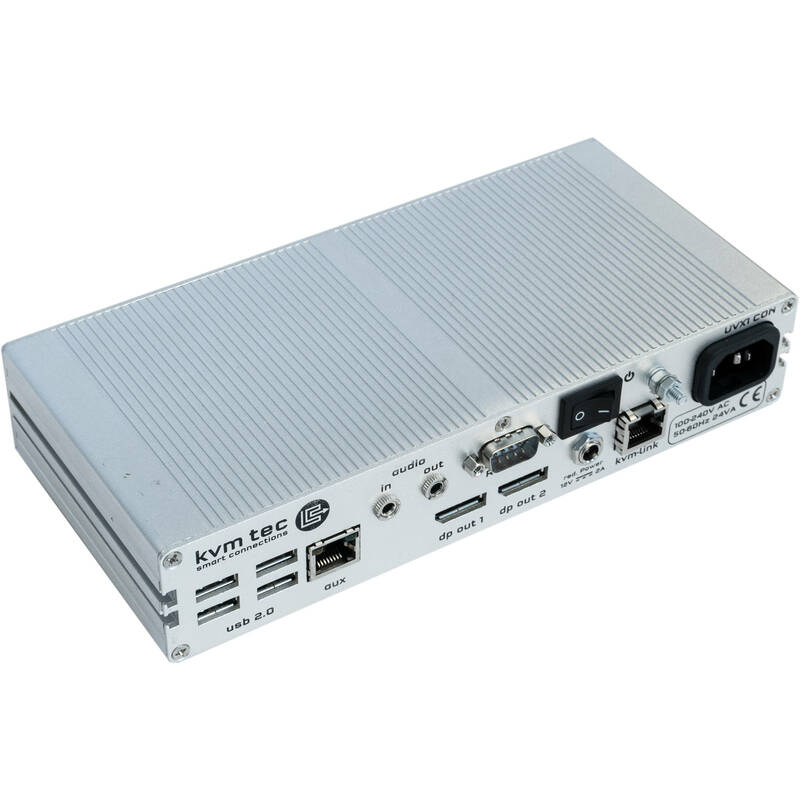 A built-in MST/HUB splitter allows the 4K monitoring output from the transmitter end to be viewed in 2560 x 1440 resolution on both the transmitter and receiver ends via DisplayPort outputs. Another key feature is a built-in Windows-compatible Switching Manager software which allows you to switch between computers in a multi-endpoint workflow from the receiver end. Switching Manager also enables the Mouse Glide & Switch feature, which lets you operate several PCs using one mouse and keyboard, and it also ensures the mouse movement is less than 5mm for a smoother, more accurate workflow. An RS-232 port and 3.5mm line in and line out jacks are provided, and the device can be integrated into a workflow of up to 2000 transmitter/receiver units via connection to an optional network switch. Any standard KVM-TEC or third-party switch is supported. Up to two units can be installed in a 19" rack using optional rackmount kits. The USB port is USB 2.0 transparent, meaning it's backwards-compatible with USB 1.0 and also supports USB 3.0 but at USB 2.0 speeds.